*Free shipping within Australia when you spend $200 or more excluding all express postal services. Standard Parcel Post applies without insurance. 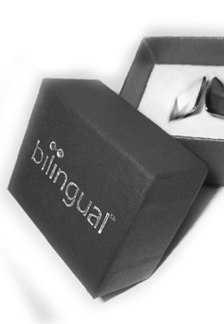 Bilingual will ship to any Australian address and to most International addresses using the postal service or a contracted courier service. It is the customers responsibility to provide accurate delivery and address details. If you have any specific or special delivery instructions please note these in the "comments" section of your order. Should your order be unable to be delivered due to either incorrect information provided by you, a re delivery fee may will apply. This fee will be charged to the credit card provided and is non-negotiable. Delivery costs flat rate $14.00 to all Australian addresses for all orders shipped via parcel post uninsured for all products. Express post delivery is available for all products uninsured from $16. Delivery rates includes postage, handling & insurance where requested. Orders will be dispatched once production is completed. Please allow 1 - 4 working days for delivery based on the shipping option purchased. All international deliveries will be calculated during order check out. While all purchases are exempt from Australian GST (10%); they may incur taxes and duties applied by customs in the country where the order is delivered. All responsibility and costs are to be borne by the purchaser. Bilingual prefers to use Australia Post Parcel Post for Domestic shipping and Registered Airmail/Post for International shipping where possible. On some occasions other delivery methods may be required to be used.